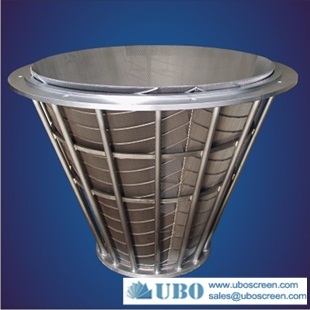 Centrifugal screen basket: is the new product of wire mesh industry. Features: easy leakage, wear and corrosion. Nets wire section for trapezoid. The gap is narrow. Materials: stainless steel, iron wire holed square model board thick 0.2-8.0 (mm). 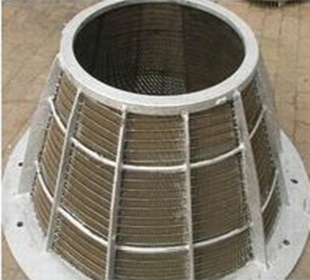 USES: widely used in mining, coal, petroleum, chemical fertilizer, food, environmental protection and other industry to sew sieve net, oil filter, salt industry with mesh. 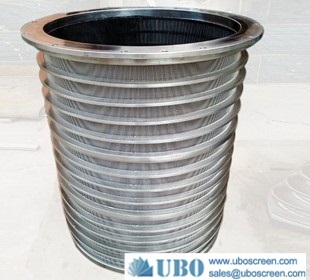 Screen basket is centrifuge dewatering equipment of key components, screen basket is mainly used in centrifugal machine dehydration, widely used in coal, chemical industry, metallurgy industry, etc. 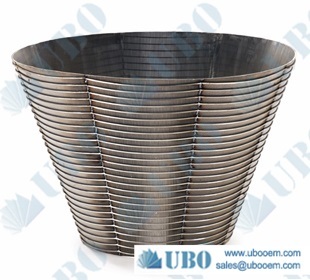 Screen basket is one of the key components of centrifugal machine, high speed rotating parts is, not only to withstand vibration sieve basket load, but also bear coal, water serious impact, so the strength and the accuracy is higher. 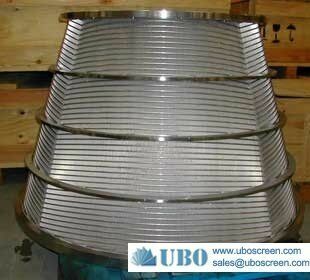 The main screen by the flanges, strengthen, ribs, strengthen the ring, stainless steel cone nets tube composition, including stainless steel cone tube by several piece of fan network screen a compound (when compound in special on die, die independent design is outsourced processing), the screen is made of stainless steel wire rolling into special shape article screen and support by special equipment welding forming article, article screening along the screen basket cone bus arrangement. 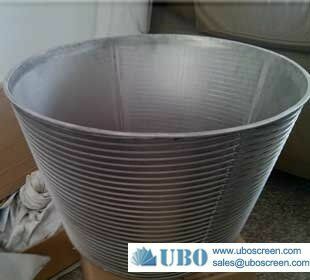 In order to reduce the sieve seam congestion, made on the small screen seam under big. 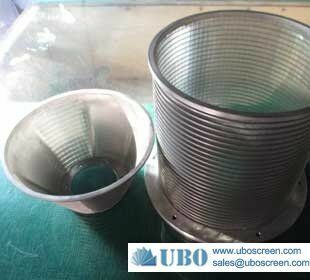 Sieve seam specifications for 0.3 ~ 1 mm general, can according to customer request. 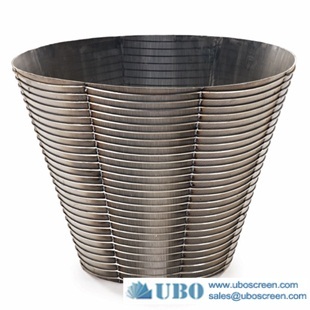 Screen basket through the flanges or next on the flange hole bolt and host into an organic whole repeatedly. Many years of practice and prove, making the screen blue stainless steel wire material USES both wear resistance and has a good pressed the material technology, as well as the special welding technology, to produce the high quality blue screen is very important. My company in this field in the international leading level. The utility model in a centrifuge double screen basket. 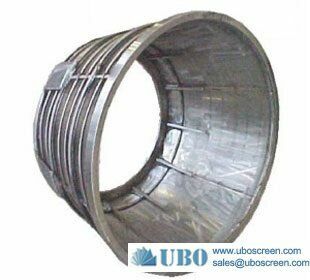 This screen basket including external screen basket, internal screening basket, sieve plate and ring sieve circle four parts; This screen basket is outside of the screen basket inside a diameter and height suit are less screen basket outside diameter and height of internal screening basket, internal screening the upper edge of the basket connecting round ring ring screen inside the circle edge, screen the outer ring ring with the edge of the screen basket internal screening wall link; Inside and outside the bottom of the screen basket, respectively, and the disc sieve plate fixed connection. 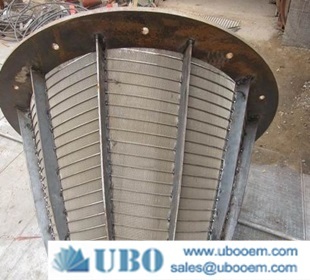 This screen basket assembly of the drying centrifuges, applicable to the vertical and horizontal centrifuge, the reasonable structure, reliable, and with it the coal dressing, good effect, large quantity, is a kind of substitution import of good dressing centrifuge model, it has great application market and economic value the utility model discloses a screen basket, belongs to the coal washing with screen basket. The circumference of the cloth at both ends are respectively and the circular column, the frame welding fixed, on, under the support of the uniform and pillar slatted welding, located in between two adjacent pillar of steel welding to pull on the diagonal, framework, sieve in pillar and welding support attrib wattle inside, pillar processing have the mouth, its cross-sectional for L form, in the post screen mesh in docking, its end embedded column the stop mouth, perpendicular to the screen and support attrib wattle column welding fixed, tensil sinew at each end have a bend and in the bend of the part on both sides and ends on the framework, respectively with welding fixed. 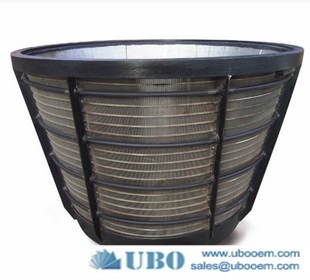 The utility model reasonable structure, and the overall strength high, make easy, long service life, it is a kind of ideal coal washing with screen basket.